In tempo di tre settimana , ci sono stati senza precedenti tre rapimenti di massa di giovani ragazze da Boko Haram in Nigeria . Appena due settimane prima del 15 aprile 2014 Chibok sequestro di 276 studentesse , Boko Haram rapito 25 giovani ragazze dalla città settentrionale di Konduga ; e il 4 maggio , undici ragazze sono state prese in WARBE , Borno State . Ci sono segnalazioni di un quarto tentativo di rapimento fallito ieri (7 maggio 2014) in Nyanya . Image: Screen shots taken from various “Shekau” videos over the course of two years. Since the release of a video claiming that he would sell 276 kidnapped school girls into slavery, Boko Haram’s leader Shekau has been denounced and reviled worldwide, which is exactly what he intended. But little has been known about the man who is the head of what has become the most talked about terrorist group in the world. Pronounced dead at least two times (2010, 2013), Shekau resurfaced after each reported death, behaving even more fanatical than the last, ruthlessly beheading infidels (especially Westerners) and arrogantly mocking the Nigerian government’s attempts at capturing him. In 2014, a “proof of death” video emerged showing yet another Shekau, who proved to be an imposter. Shekau is a dead man walking, a warlord seeking a legacy that will be filled with horrific memories of brutality. TRAC has compiled the first in-depth portrayal of the enigmatic recluse turned brutal cult despot with a photogenic memory and no recorded past: Who is the real Abubakar Shekau (aka Abu Muhammad Abubakar Bin Muhammad) : Boko Haram’s Renegade Warlord. In three week’s time, there have been an unprecedented three mass abductions of young girls by Boko Haram in Nigeria. Just two weeks before the April 15, 2014 Chibok abduction of 276 schoolgirls, Boko Haram kidnapped 25 young girls from the northern town of Konduga; and on May 4, eleven girls were taken in Warbe, Borno State. There are reports of a fourth botched abduction attempt yesterday (May 7, 2014) in Nyanya. In total, over 300 schoolgirls have been recently abducted; Boko Haram leader Abubakar Shekau announced in a video that he planned to sell these schoolgirls, some as young as 12 years old, on the open market, in spite of earlier reports that the abductors were infighting about what to do with their hostages. The infighting within Boko Haram mirrors what is occurring on a larger scale within the leadership of the group. Shekau has been the face and presumed leader of Boko Haram, but he is only one of a triumvirate in a power struggle to control a group that seems out-of-control. 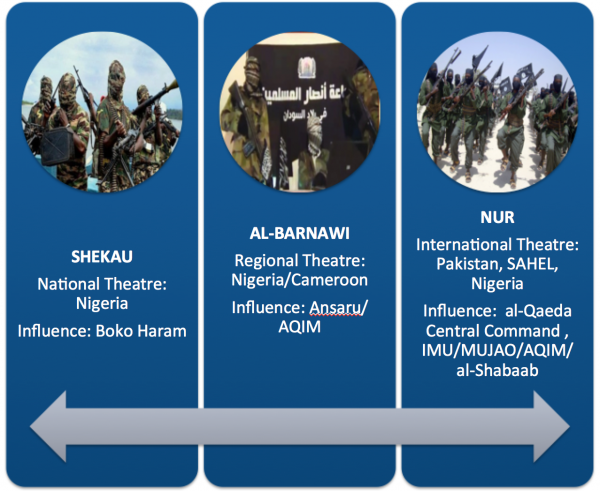 TRAC has profiled each of Boko Haram’s three power players: Abubakar Shekau, Khalid al-Barnawi, and Mamman Nur. Together they form a triad that is pulling Boko Haram in two very different directions on two different fronts. Details on the power players of Boko Haram can be found in The Triad of Leaders in Boko Haram reflects it’s Larger Transnational Aspirations. This article will be unlocked for 15 days. The kidnapping of the schoolgirls was followed by two violent attacks on the road between Maiduguri and Chibok, where the schoolgirls were abducted, and in Gamboru Ngala near the Nigeria/Cameroon border. It was reported that some of the victims in these attacks were burned alive. Yesterday (Wednesday, May 7) was a big day for Boko Haram as their militants laid in wait for the Nigerian Army to depart towards the border with Chad (where the girls are believed to be held) before launching a massive assault on the village of Gamboru Ngala. The attack that left at least 150 dead included three Armored Personnel Carriers (APCs). Although it was known that Boko Haram possessed one APC, reports of three APCs generated fears that Boko Haram poses even more of a threat then previously thought. 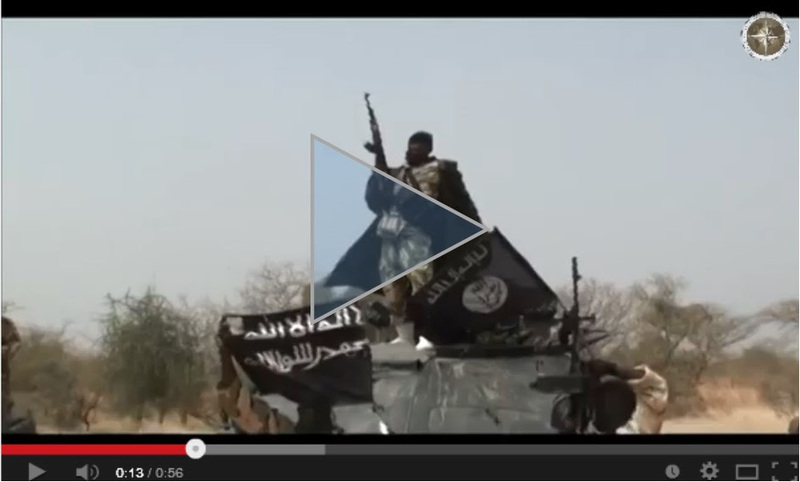 Video: Boko Haram “shows off” its Armored Personnel Carrier: The APC in the video strongly resembles the Soviet BRDM-2 turret version, but it is a Czech OT-65A3 circa 1969 with a short range radar on top. Most of these modified APC vehicles use 76mm recoilless ammunition and rocket launchers. 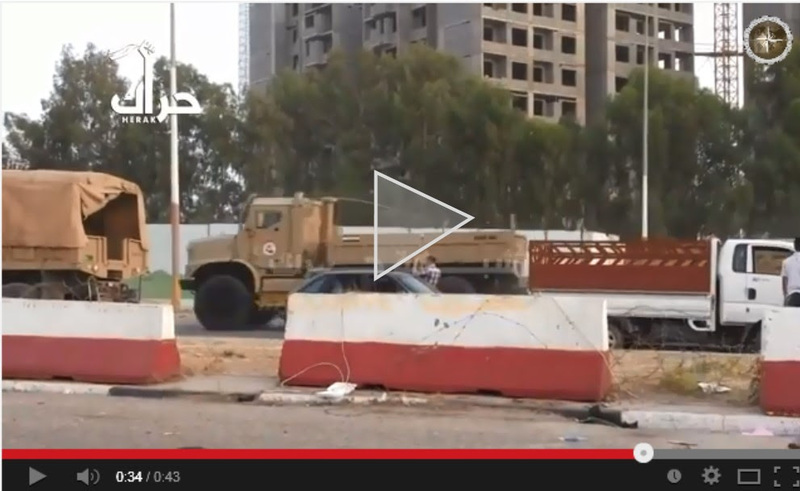 Choppy welds on the front of the tank suggest that Boko Haram may have converted this APC to an assault vehicle. This APC was developed as an alternate to the Soviet built BRDM-2 scout car (originally designated FUG-66 or FUG-70) that is very similar to the FUG/OT-65 amphibious scout vehicle. Until this video was released, it was not known that Boko Haram had access to these armored vehicles, and the burning questions are: how did Boko Haram acquire these advanced weapons and how did they get to Nigeria undetected? Click image above to watch video. To obtain more information on Boko Haram and the many incidents this group has been involved in, please contact Hylda Fenton today about gaining full access to thousands of pages of expert insights and analyses. We also encourage you to view a collection of news clips and primary resource video releases, which can be accessed on our TRAC Focus on Nigeria channel. In totale , oltre 300 studentesse sono stati recentemente rapite ; il Leader di Boko Haram Abubakar Shekau ha annunciato in un video che aveva in mente di vendere queste studentesse , alcuni di appena 12 anni , sul mercato libero , a dispetto di precedenti rapporti che i rapitori evidenziavano con lotte intestine su cosa effettivamente fare con i loro ostaggi . 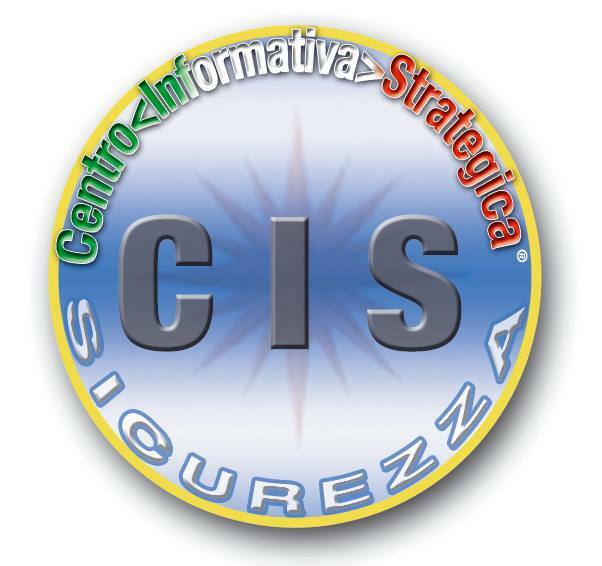 La lotta all’interno di Boko Haram rispecchia ciò che sta avvenendo su scala più ampia all’interno della leadership del gruppo. Shekau è stato il volto e il presunto leader dei Boko Haram , ma lui è solo uno di un triumvirato in una lotta di potere per controllare un gruppo che sembra fuori controllo. TRAC ha profilato ciascuno dei tre giocatori potenti di Boko Haram : Abubakar Shekau , Khalid al- Barnawi e Mamman Nur . Insieme formano una triade che sta tirando Boko Haram in due direzioni molto diverse su due fronti diversi . Dettagli sui giocatori potenti di Boko Haram possono essere trovati nella triade dei leader a Boko Haram riflette le aspirazioni transnazionali più grandi . Questo articolo sarà sbloccato per 15 giorni . Il rapimento delle studentesse è stato seguito da due violenti attacchi sulla strada tra Maiduguri e Chibok , dove sono state rapite le studentesse , e in Gamboru Ngala vicino al confine con la Nigeria / Camerun . E ‘stato riferito che alcune delle vittime di questi attacchi sono stati bruciati vivi . Ieri ( Mercoledì 7 maggio ) è stato un grande giorno per i Boko Haram con i loro militanti disposti in agguato per l’esercito nigeriano per partire verso il confine con il Ciad ( dove si pens terrànno le ragazze ) prima di lanciare un massiccio attacco sul villaggio di Gamboru Ngala . L’attacco che ha lasciato almeno 150 morti inclusi tre Armored Personnel Carriers ( APC ) . Anche se era noto che Boko Haram possedeva un APC , segnalazioni di tre APC che hanno generato timori. Boko Haram si pone ancora di più che una minaccia, rispetto in precedenza. 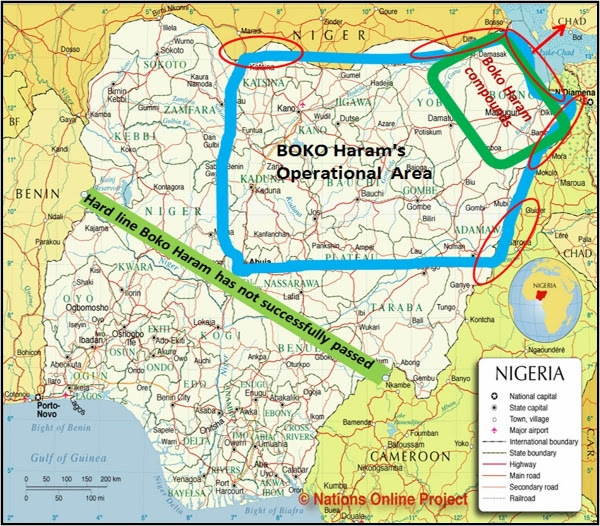 Image: Boko Haram’s operational area showing their main compound, satellite compounds, and the hard line they have not successfully penetrated. Was ISIS’s Plunder of Mosul an Insider Job? 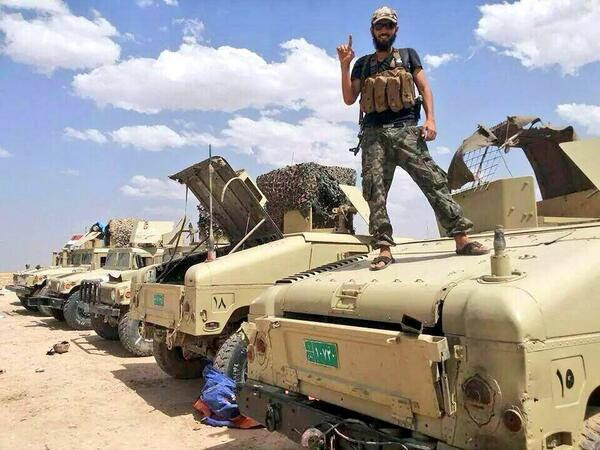 Upon the attack on Mosul June 9, 2014 by ISIS militants, the once recognized and respected Iraqi security forces (trained by the United States) reportedly abandoned their posts and “fled” in convoys. Photos of Iraqi forces leaving Mosul by way of the main road, shows an Iraqi force not in disarray whilst “fleeing”, but executing a planned evacuation, as if defending the city was never an option. By June 10th, all security personnel had left Mosul, begging the question: what were the reasons for the abrupt retreat? The New York Times reported that the Iraqi military might have been ordered to retreat. If so, this was the most expensive bank robbery setup in history. TRAC sources report that a deal was struck between ISIS and a high-ranking government official; rewarding ISIS with a major arsenal of weapons including Black Hawk and Apache air power and the unnamed government official receiving the lion’s share of the money. Will ISIS follow through on the deal or will this be a double-cross against Iraq’s government and maybe the fleecing of America? TRAC is offering this exclusive content, Was ISIS’s Plunder of Mosul an Insider Job? for FIVE days only. To obtain more information on ISIS and the many incidents this group has been involved in, or to subscribe to TRAC, please contact Hylda Fenton today. We also encourage you to view a collection of news clips and primary resource video releases, which can be accessed on our TRAC Focus on Syria channel. Do you have a colleague or associate that you feel would benefit from our TRAC Briefings? If so, please forward this newsletter to them and invite them click on “Subscribe to TRAC Briefings” link below. Questo contenuto è stato inserito il Maggio 8, 2014 ore 5:36 pm nelle categorie Flash News, Scenari internazionali, SICUREZZA PARTECIPATA. puoi seguire i commenti tramite RSS 2.0 feed.